Water-based to keep your fabrics safe! Mötsenböcker’s Lift Off from Stoner—Food, Drink, & Pet Stain Remover is patented with Mötsenböcker’s Lift Off formula for fast and easy removal of coffee, chocolate, juice, ketchup, pet stains, blood, grass, and dirt on all carpeted or upholstered surfaces in your vehicle! The molecular bond of the stain is broken up quickly and safely maintaining the quality of your fabrics. 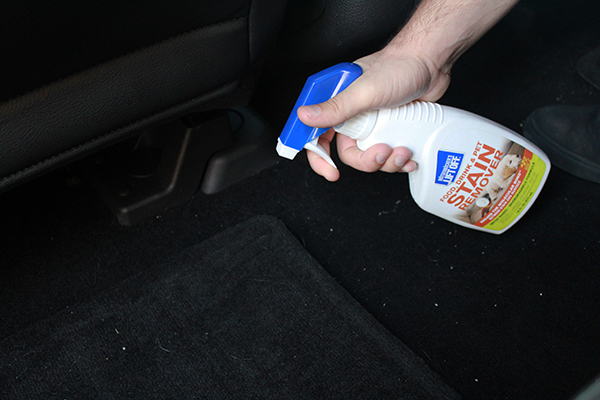 Food, Drink, & Pet Stain Remover is the safer way to removing stains from your vehicle’s fabric surfaces. Mötsenböcker’s Lift Off formula is water-based and biodegradable, leaving out the harsh chemicals that are harmful to the environment. Stoner Food, Drink, & Pet Stain Remover works to remove your stains while keeping our environment healthy! Removes stains easily with a quick spray and a little agitation! To use, wipe area with a dry cloth to remove any loose contaminants. Spray stain thoroughly with Food, Drink, & Pet Stain Remover and let sit for at least 60 seconds. Use a brush to agitate the stain out. Blot dry with a dry towel.